The Dunwich Dynamo has grown in popularity over the years, with many riders now considering it to be one of the iconic rides of the year. Always held on the Saturday night/Sunday morning of the full moon in July, it is a through-the-night ride from Hackney's London Fields to the village of Dunwich, on the Suffolk coast. The bare facts are that it is a 179.5km ride (111.5 miles) with a total of 1,400 metres of climbing (4,593 feet), which makes it a somewhat challenging ride but should be fine for most reasonably fit cyclists. There are no killer climbs along the route and most of the route is gently undulating rather than an Alpine challenge. We'd say it was about a three or four out of ten for difficulty. People ride on all sorts of bikes, from city commuters to race bikes. We'd recommend you don't try and cycle in jeans - 179.5km in jeans is really, really uncomfortable. The official start time of the Dunwich Dynamo is 9pm but people start gathering at the Pub on the Park (Martello Street, Hackney, E8 3PE) by London Fields from about 7pm. There is no organised timing for the event...it is all semi official and people just start going off in waves with riders who appear to be of similar ability. It is not a race! You might not want to have ten pints before you set off either though. The route goes out of London through Lower Clapton, onto the Lea Bridge Road and Woodford New Road and then out to Epping Forest. The early part of the route is through some of the meaner streets of Hackney (not far off what is locally known as Murder Mile) and it does make sense to try and stick together with a few other riders around here, just on the basis of safety in numbers (especially if you are riding a five grand bike). Once you are in Epping Forest, you cross the North Circular road and head out through the forest to Epping, then to North Weald, Morton, Leaden Roding and Great Dunmow. It is around this sort of area that you start to encounter pop up stalls selling flapjacks, cakes, coffee and glasses of Coca Cola, which beats most sportive fuelling stations. 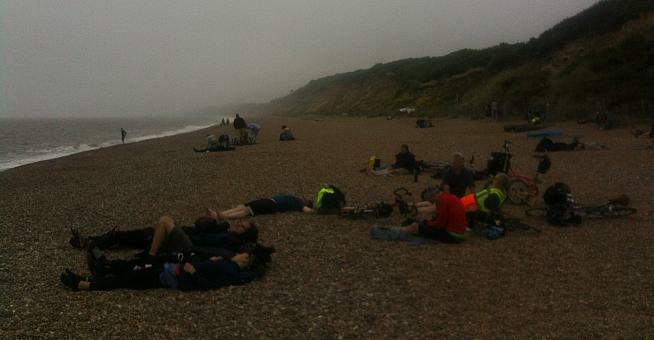 It is worth remembering the etiquette of the Dunwich Dynamo. Don't drop litter, don't chat loudly going through villages in the middle of the night and don't play music (unless through headphones). The more riders stick to this, the less likely the police will feel they need to intervene and close down the Dynamo because it has got too big and disruptive. From Great Dunmow the route passes through Finchingfield, Castle Hedingham (which is the only point where there is any sort of proper climb, with a 400 metres stretch at just over 5%), Sudbury, Bildeston and then Needham Market. You are now only 52km from your destination! The next major village is Framlingham, then Peasenhall, Westleton and finally Dunwich. A reasonably fit sportive rider should do this ride in about nine hours, excluding stops, which means you would arrive at around 6am. The fastest riders get there at 4am, which means they have a lot of sitting around to do. The Flora Tea Rooms opens at 6am (sometimes earlier) and The Ship at Dunwich opens from 3am, serving breakfast and beer. Once you have had your breakfast and/or recovery pint and a swim in the sea, you need to work out how to get home. Some brave souls decide to cycle back to London but most people use the coaches (pre booking is absolutely essential!) or try and get a space on a train home (Darsham is the nearest station but they don't take bookings and allow a very limited number of bikes on the trains, you might have to cycle back to Ipswich, which is about 31 miles away). The ideal thing is to have a family member ready to drive you home while you have a snooze in the back seat! If you want to download the route onto your cycling computer, we recommend Nigel Tamplin's Dunwich Dynamo Strava file, which you can download as either a GPX or TCX file.